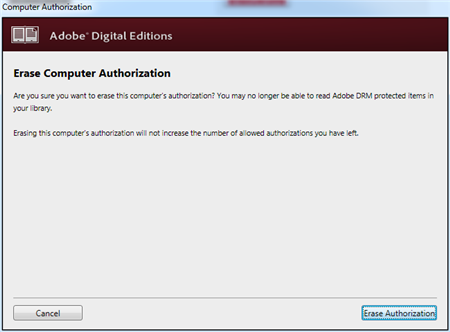 To read downloaded DRM-protected eBooks on your computer, you’ll need to authorize Adobe Digital Editions (ADE), but only authorize up to six computers and/or devices, you can erase authorization from computer to authorize more device. 1 If you aren’t prompted to authorize ADE the first time you open it, you can go to Help > Authorize Computer to start the process manually. 2 If you have an Adobe ID, enter it along with your password. 3 If you do not have an Adobe ID, click Create an Adobe ID to make one on Adobe’s website. 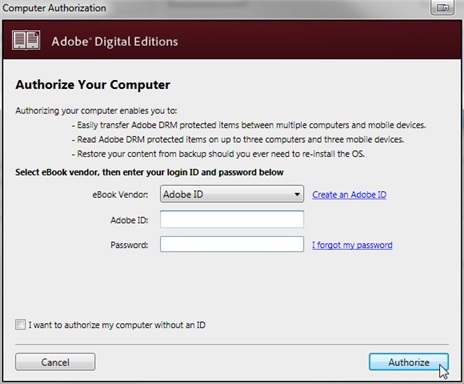 Once you’re done, return to the “Computer Authorization” dialog box and enter your Adobe ID and password. 4 Click Authorize. Your computer is now authorized with your Adobe ID. Note: If you choose to authorize your computer without an ID, you will still be able to view eBooks on your computer. However, you will not be able to transfer or download those titles to other devices.